Steel box cover with 1/2" knockout in the center. 2-5/16" wide x 4-3/16" tall. UL Listed. PVC handy box used for many wiring applications. Weather-resistant and nonconductive. Will accept metal handy box covers or nonmetallic covers. Includes hardware for quick, easy installation. Old work wall case. Safe, non-conductive. Two Zip-Mount retainers. Four integral clamps, two each end; mounting ears. 14 cubic inch, 2-3/4" x 2-1/4" x 4-1/8". UL Listed. Steel box cover with 1/2" knockout in the center. Key hole mounting feature allows for installation of cover without removing box screws. UL Listed. Steel box cover with single 1/2" knockout in the center. Key hole mounting feature allows for installation of cover without removing box screws. UL Listed. Steel box cover with single 1/2" knockout in the center. 4" square. Angled mounting slots allow for correction of box misalignment. UL Listed. Used to close outlet box. For mounting switch or receptacle. Size 4" x 4",steel, UL Listed. Used for convenience outlets, switch boxes or small junction boxes. Drawn construction and raised grounding provision. Acceptable for use in 2-hour rated walls. Six 1/2" knockouts (sides). Two 1/2" knockouts (ends). Two 1/2" knockouts (bottom). 4" x 2" x 1-7/8" deep. 13.0 cubic inch capacity. UL Listed. New work safe, non-conductive. With captive nails. Eight integral clamps, four each side. 32 cubic inches. Meets NEMA OS-2, UL Listed, classified for fire wall assemblies. 3" depth x 4" x 3-3/4". New work applications, shallow PVC switch box. Integral brackets. 1-1/4" depth x 2-3/8" x 3-5/8". UL Listed. Conduit wiring system. Installed in ceilings or walls for lighting fixtures, switches or receptacles. Used where multiple conductor runs are split into two or more directions to bring power to a number of electrical devices. Drawn construction and raised grounding provision for surface mount applications in ceilings or walls for lighting fixtures or receptacles. Eight 1/2"and four 3/4" conduit knockouts (sides). Two 1/2" and two 3/4" conduit knockouts (bottom). 4" square x 1-1/2" deep - 21.0 cubic inches. Acceptable for use in 2-hour rated fire walls. UL Listed. UPC bar code. Two gang blank rise. Carlon blue color. Two device switch box cover. Made from unpainted, pregalvanized steel. Used with 2 toggle 2 gang switch boxes. UL 514-A Listed, File E195978 / CSA Listed, File LR-1082. Two 1/2" and two 3/4" conduit knockouts (sides). Two 1/2" and two 3/4" conduit knockouts (bottom). No bracket. Can be used in the installation of ceiling or wall lighting fixtures or as a junction box. Not designed for ceiling fan support. 50 pound maximum recommended static load. Acceptable for use in 2-hour fire rated walls. UL Listed. UPC bar code. Used where multiple conductor runs are split into two or more directions to bring power to a number of electrical devices. Drawn construction and raised grounding provision for exposed work or surface mount applications. Combination cover screw heads provide for faster mudring/cover installation. Twelve 1/2" conduit knockouts (sides). Four 1/2" conduit knockouts (bottom). No bracket. 4" square x 1-1/2" deep - 21.0 cubic inches. UL Listed, acceptable for use in 2-hour fire rated walls. UPC bar code. Half inch raised round high impact lightweight PVC. Used with nonmetallic sheathed cable in octagon boxes. Supports 50 pounds. UL Listed. Raised device cover. Used to hang light fixture from 4" square box. Not designed for ceiling fan support. Angled mounting slots allow for correction of box misalignment. Raised 5/8" - ears 2-3/4" - 4 cubic inches. UL Listed. UPC bar coded. Steel box cover, used to mount switch or receptacle. UL Listed. Extends an existing box by 1-1/8". Used to correct problems from remodeling where the wall surface is extended. Fits between the wiring device and the wall surface. Extends the switch or outlet box to flush with the wall. Works with all standard wiring devices. 2-1/4" x 3-1/4". UL Listed. Designed and listed for use with non-metallic sheathed cable. With mounting ears. Permissible for use with 90 degree C connectors. 8 cubic inch capacity. 1-1/4" depth x 2-3/8" x 3-5/8". UL Listed. Safe, non-conductive. With bracket for 3/8" to 5/8" wallboard. Steel and wood studs, 4 knockouts. 2-15/16" depth x 3-3/4" x 2-1/4". 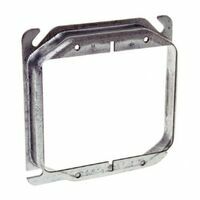 Raco Plaster Ring Cover, Raised, Square, 1/2 in Length, 4 in Width, 4 in Depth, 1 Gangs, 3 cu-in Capacity, Steel, Gray, Galvanized, UL E195978, CSA LR-1082, For Mounting Switches or Receptacle and Lighting Fixtures Raco Handy Box Cover, Flat, 4-3/16 in Length, 2-5/16 in Width, 1 Gangs, Steel, Gray, Galvanized, UL E195978, CSA LR-1082, 1.594 in Opening, For used to close a handy box and also may be used as single gang wall plates Four 1/2" conduit knockouts (sides). Four 1/2" conduit knockouts (bottom). No bracket. Used in the installation of ceiling or wall lighting fixtures or as a junction box. 1-1/2" deep, 15.5 cubic inch capacity. Not designed for ceiling fan support. 50 pound maximum recommended static load. Acceptable for use in 2-hour fire rated walls. UL Listed. UPC bar code. For telecommunications and other low voltage wiring. Suitable for old work applications. 1.18" depth x 2.18" x 3.05". Plaster ears, old work swing style clips secure box in wall. Integral clamps. Two hour fire rated. Mounting clips. 3" depth. 14.0 cubic inch capacity. UL Listed. Steel box cover for one duplex receptacle. Key hole mounting feature allows for installation of cover without removing box screws. UL Listed. 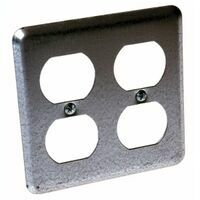 Raco Single Device Cover, Drawn, Square, 1 in Length, 4 in Width, 4 in Depth, 1 Gangs, 7.5 cu-in Capacity, Steel, Gray, Galvanized, UL E195978, CSA LR-1082, 1 in Raised, For Mounting Switches or Receptacles Raco Wall Plate, 4 in Length, 4 in Width, 4 in Depth, 2 Gangs, Steel, Gray, Galvanized/Zinc Coated, Screw Mounting, UL E195978, CSA LR-1082 Used to hang light fixture from 4" octagon box or 4" round ceiling pan. Not designed for ceiling fan support. Key-hole mounting feature allows for installation of cover without removing box screws. Raised 5/8" - 3.8 cubic inch capacity. UL Listed. Welded design allows for more working room inside box. Six 1/2" knockouts (sides). Two 1/2" knockouts (ends). Three 1/2" knockouts (bottom). Acceptable for use in 2-hour rated walls. UL Listed. Rugged construction, used to close an outlet box. Key hole mounting feature allows for installation of cover without removing box screws. 4-11/16" square. UL Listed. Used to close outlet box. For mounting switches or receptacles. Size 4", UL Listed. Non-metallic, non-conductive. Punch type knockout. Quickly connects. Square, fits commercial and residential requirements. For 600 volt use in ceilings, floors, and walls in commercial, industrial and residential buildings not more than three floors above grade. Colored in brilliant electric blue. 3" x 2-1/4" x 1-7/8". UL Listed. 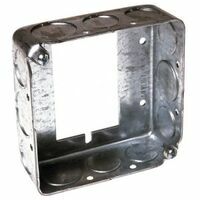 Steel box cover, 4", used to mount two switches or receptacles. UL Listed. Used to close outlet box. For mounting switches or receptacles. Size 4", UL Listed. Thermoset-fiberglass, with angled mid-nails. Nails are installed as fastening devices. 2 hour wall and ceiling fire rating. Lightweight, non-corrosive, non-conductive, no ground required, will not melt or distort in high heat. Shatter resistant in cold temperatures. UL Listed. 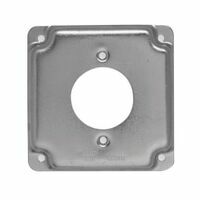 Raco Single Device Cover, Drawn, Square, 1-1/4 in Length, 4 in Width, 4 in Depth, 1 Gangs, 9.5 cu-in Capacity, Steel, Gray, Galvanized, UL E195978, CSA LR-1082, 1-1/4 in Raised, For Mounting Switches or Receptacles Used to close outlet box. For mounting switch or receptacle. Size 4" x 4",steel, UL Listed. Safe, non-conductive. Quick connect. 20.5 cubic inch capacity. Knockouts 1/2" x 3/4". 4" diameter x 2-1/8" depth. Six 1/2" and 3 TKO conduit knockouts (sides). Three 1/2" and 2 TKO conduit knockouts (bottom). Combination cover screw heads provide for faster mudring/cover installation. 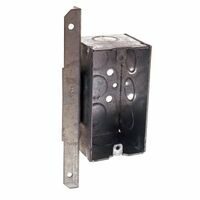 FM bracket mounts flat on side of stud and provides a rigid, secure box installation. Square boxes are installed in ceiling or walls for lighting fixture or receptacles. 4" square x 1-1/2" deep - 21.0 cubic inches. UPC bar code. UL Listed. With captive nails. 18 cubic inch volume. Listed for fixture support up to 50 lb. 3" diameter x 2-3/4" depth. Meets NEMA OS-2, UL Listed. Non-metallic, non-conductive. Punch type knockout. Quickly connects. Square, fits commercial and residential requirements. For 600 volt use in ceilings, floors, and walls in commercial, industrial and residential buildings not more than three floors above grade. Colored in brilliant electric blue. 3" x 2-1/4" x 1-7/8". UL Listed. PVC handy box used for many wiring applications. Weather-resistant and nonconductive. Will accept metal handy box covers or nonmetallic covers. 35 cubic inch rigid wall. Used to add additional wiring capacity to handy box. Six 1/2" knockouts (sides) and two 1/2" knockouts (ends). 4" x 2" x 1-7/8" deep. 13.0 cubic inch capacity. UL Listed. Ceiling box with captive nails, ground lug and screw attached. Fixture spacing for 2-3/4" and 3-1/2". 6 integral clamps. Listed for fixture support up to 50 lb. 4" diameter x 2-1/4" depth. UL Listed. Meets NEMA OS-2. Backless bracket with nail on mounting and screw in bracket. Non-metallic. Non-conductive. 3.73" x 2.32". Non-metallic. Non-conductive. Suitable for masonry walls. 4" x 4" x 1-1/2". 1/2" and 3/4" knockouts. UL Listed. Used to add additional wiring capacity to handy box. Six 1/2" knockouts (sides). Two 1/2" knockouts (end). 4" x 2" x 1-1/2" deep. 11.5 cubic inches. UL, CSA Listed. Welded design allows for more working room inside box. Six 1/2" knockouts (sides). Two 1/2" knockouts (ends). Three 1/2" knockouts (bottom). Acceptable for use in 2-hour rated walls. UL Listed. Used to close outlet box. For mounting switches or receptacles. Size 4", UL Listed. Steel box cover for single toggle switch. Key hole mounting feature allows for installation of cover without removing box screws. UL Listed. For one duplex receptacle. Raised 1/2". 6-1/2 cubic inch capacity. 4" square. UL Listed. Round old work box with 4 integral swing clamps. Three zip mount retainers. High temperature resistant. 4-1/4" diameter x 2-3/4" depth. UL Listed. Thomas & Betts Ceiling Box, Suitable For Use With: Fixture Support Upto 50 lb, 18 cu-in Volume, Captive Nail Mount, Non-Metallic, Blue, 3 in Diameter X 2-3/4 in Depth, Includes: Captive Nails, Ground Lug and Attached Screw, UL-E42728 Raco Plaster Ring Cover, Raised, Square, 3/4 in Length, 4 in Width, 4 in Depth, 1 Gangs, 5 cu-in Capacity, Steel, Gray, Galvanized, UL E195978, CSA LR-1082, For Mounting Switches or Receptacles Conduit wiring system. Eight 1/2" and four TKO conduit knockouts (sides). Two 1/2" and two TKO conduit knockouts (bottom). 4" square x 2-1/8" deep, 30.3 cubic inch capacity. Combination cover screw heads provide for faster mudring/cover installation. No bracket, installed in ceilings or walls for lighting fixtures and receptacles. Acceptable for use in 2-hour rated fire walls. With UPC bar code. UL Listed. Spring metal mounting brackets. Fixture rating limit of 10 pounds. Heat resistant. 3-1/2" diameter round old/new work box base, ears and snap-in bracket. UL Listed. Raised 1/2". For two toggle switches. 6-1/2 cubic inch capacity. UL Listed. Steel box cover with single 1/2" knockout in the center. 4-11/16" square. UL Listed. Gangable 3" x 2" switch box, offers the option of constructing a box to hold two or more devices. Beveled corners prevent the clamp screws from protruding into the back wall. With nonmetallic sheathed cable clamps. Acceptable for use in 2-hour fire rated walls. Four cable knockouts (end). Two 1/2" conduit knockouts (end). 1/2" conduit knockouts (bottom). With leveling bumps. No plaster ears, not suitable for old work. 2-1/4" deep - 10.5 cubic inches. UL Listed. Used to mount one toggle switch on box in surface mount applications. Raised 1/2". 6-1/2 cubic inch capacity. UL Listed. Drawn construction and raised grounding provision for surface mount applications. Four 3/4" knockouts (sides). Two 3/4" knockouts (ends). One 3/4" knockout (bottom). 4" x 2" x 1-7/8" deep. 13.0 cubic inch capacity. UL Listed. Drawn metal 4" octagon box used in the installation of ceiling or wall lighting fixtures or as a junction box. Not designed for ceiling fan support. Maximum recommended support load for a static fixture is 50 lb. 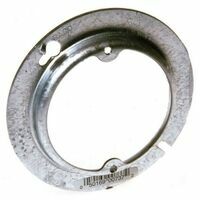 TS bracket for wood or metal studs features gauging tabs and recessed nailing spurs. 1-1/2" depth, 1/2" bracket setback, three 1/2" side knockouts, five 1/2" bottom knockouts. 15.5 cubic inch capacity. Combination screw heads allow for fast cover or fixture installation. Acceptable for use in 2-hour rated walls and ceilings. UL Listed. For installation of low-voltage devices in an existing wall. Thinner rectangular flange for faster, easier installation, less protrusion on the wall. Shallow bracket means less material, easier to work with. Can be installed vertically or horizontally. UL listed. Combination ceiling box, hard shell with captive nails and grounding lug. 3" depth. Listed for fixture support up to 50 lb. 4.062" diameter x 3" depth. UL Listed. For one GFCI receptacle and one duplex receptacle. 6.5 cubic inch capacity. UL Listed, CSA Listed. Provides simple installation and allows adjustment from 0 to 1-3/4" with the turn of a screw. Clip the included bracket onto any stud, mounts square and secure every time. Securing the bracket to the stud ensures that the box will not move. Comes preset at 1/2". 3-3/8" depth x 3-7/8" x 3-3/4". Permissible for use with 90 degree C connectors. Satisfies NEC 370-20. UL Listed 5Z74 and classified 2 Hr W/C. Four cable knockouts (end). Two 1/2" conduit knockouts (end). One 1/2" conduit knockout (bottom). With non-metallic sheathed cable clamps. Leveling bumps. Less ears. 3" x 2" x 2-1/2" deep. 12.5 cubic inches. Acceptable for use in 2-hour rated fire walls. UL Listed. Two 1/2" and two 3/4" conduit knockouts (sides). 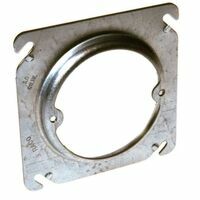 Extension rings provide a means for adding additional cubic capacity or as and outlet box for surface conduit. Non-metallic sheathed cable wiring system. Clamps in bottom. Four cable knockouts, one 1/2" conduit. 3-1/2" diameter x 1/2" depth. UL Listed. Conduit wiring system. Four 1/2" conduit knockouts (sides). Two 1/2" conduit knockouts (end). Two 1/2" conduit knockouts (bottom). Less clamps. 3" x 2" x 2-1/2" deep. 12.5 cubic inches. Acceptable for use in 2-hour rated fire walls. UL Listed. For one each duplex receptacle and toggle switch. 4" square. Raised 1/2". 6.5 cubic inch capacity. UL Listed. Fits Carlon single gang FS boxes. Paintable surface with textured finish to hide scratches. 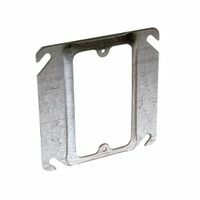 Stainless steel mounting screws and gasket included. UL, CSA Listed. With mounting ears and 2 swing clamps. Suitable for masonry walls, UL Listed, not UL Classified for fire resistance. 2-3/4" depth x 3-1/8" x 3-15/16"
With captive nails and bracket support, twelve integral clamps, six each side. 44 cubic inch capacity, 2-11/16" depth x 3-3/4" x 5-5/8". Meets NEMA OS-2, UL Listed, classified for fire wall assemblies. With captive nails and ten integral clamps, three top and bottom, two each side. Suitable for masonry walls. 4" x 4" square. UL Listed. Listed for masonry walls, permissible for use with 90 degree C connectors. For use with non-metallic sheathed cable. UL classified for 2 hour fire wall or fire ceiling. 3-1/4" length x 2-1/4" width x 1-7/16" depth. 7.5 cubic inch capacity. Mounting ears. UL Listed. 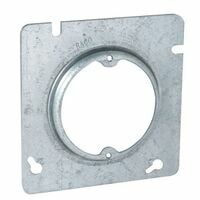 Raco Exposed Work Cover, Raised, Square, 1.62 in Diameter, 1/2 in Length, 4 in Width, 4 in Depth, 1 Gangs, 6.5 cu-in Capacity, Steel, Gray, Galvanized, UL E195978, CSA LR-1082, For used to support switches or receptacles in areas where the box is surface mounted or positioned in exposed work applications For two GFCI receptacles. 6.5 cubic inch capacity. UL Listed, CSA Listed. Two 1/2" and two 3/4" conduit knockouts (sides). Three 3/4" and two 1/2" conduit knockouts (bottom). No bracket. Can be used in the installation of ceiling or wall lighting fixtures or as a junction box. Not designed for ceiling fan support. 50 pound maximum recommended static load. Acceptable for use in 2-hour fire rated walls. UL Listed. UPC bar code. Three 1/2" knockouts (sides). 4" x 2" x 1-7/8" deep. 13.0 cubic inch capacity. "A" style bracket for wood or metal, positions handy box securely against face and side of stud. Acceptable for use in 2-hour rated walls. UL Listed. Beveled corner box, designed to prevent the clamp screws from protruding into back wall. Non-metallic sheathed cable clamps. Acceptable for use in 2-hour rated walls. Four cable knockouts (end). One 1/2" conduit knockout (bottom). No bracket, clamp screws through beveled corners. With ears. 3" x 2" x 2-1/4" deep. 10.5 cubic inches. UL Listed. Four cable knockouts (end). Two 1/2" conduit knockouts (end). One 1/2" conduit knockout (bottom). With non-metallic sheathed cable clamps. "TS" brackets for wood or metal studs. Gauging tabs and recessed nailing spur. Side mount. 3" x 2" x 2-1/2" deep. 12.5 cubic inches. UL Listed. Five 1/2" bottom conduit knockouts, 6 cubic inch capacity. Acceptable for use in 2-hour rated walls and ceilings. 4" diameter x 1/2" depth. UL Listed. Shallow switch box, made for use with furring strips and 1/4" paneling. Welded, with nonmetallic sheathed cable clamps. Two cable knockouts (end). One 1/2"' conduit knockout (end). D bracket for wood or metal studs. 1/4" bracket setback. 1" deep - 6.5 cubic inches. UL Listed. Four cable knockouts on the end. 3" x 2" x 1-1/2" deep. 7.5 cubic inches. With clamps for non-metallic sheathed cable. Plaster ears allow the box to be used in old work applications. Acceptable for use in 2-hour fire rated walls. UL Listed. Four cable knockouts (ends). One 1/2" conduit knockout (bottom). With clamps for non-metallic sheathed cable. "S" backset. Mounting guides set 3/8", with bumps. Angle nail type. 3" x 2" x 2-27/32" deep, 15.8 cubic inch capacity. Prepositioned mounting nails included. Acceptable for use in 2-hour rated walls. UL Listed. Used to mount switches or receptacles on boxes in surface mount applications. Raised 1/2". 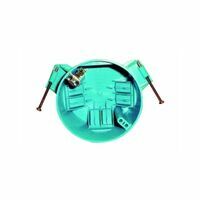 For one 30-50 amp, single receptacle, 2.141" diameter. 6-1/2 cubic inch capacity. 4" square. UL Listed. Gangable 3" x 2" switch box, offers the option of constructing a box to hold two or more devices. Plaster ears allow the box to be used in old work applications. Acceptable for use in 2-hour fire rated walls. Four 1/2" conduit knockout (sides). Two 1/2" conduit knockout (end). Two 1/2" conduit knockouts (bottom). 2" deep - 10.0 cubic inches. UL Listed. For conduit. 3" x 2" switch box. No bracket, adjustable plaster ears allow box to be used in old work applications. 14.0 cubic inch capacity, 2-3/4" deep, four 1/2" side knockouts, two 1/2" bottom knockouts and two 1/2" end knockouts. Acceptable for use in 2-hour rated fire walls. UL Listed. Non-metallic, UL classified for 2 hour fire wall or fire ceiling. UL Listed. Enables line voltage and low-voltage to run to the same location. Uses standard 2 gang faceplate. Backless design accommodates large/deep low voltage devices. 3.69" x 4.04". 20.5 cubic inch capacity. UL approved. Thermoset-fiberglass with ears, wing brackets, speed clamps. 2 hour wall and ceiling fire rating. Lightweight, non-corrosive, non-conductive, no ground required, will not melt or distort in high heat. Shatter resistant in cold temperatures. 2-7/8" x 2-3/8" x 3-1/4". UL Listed. For convenience outlets, switch boxes or small junction boxes for exposed work applications. 4" x 2", with four 3/4" conduit knockouts (sides), two 3/4" conduit knockouts (bottom) and two 3/4" knockouts (end). 4" height x 2" width x 2-1/8" deep. 16.5 cubic inch capacity. Welded design allows for more working room inside box. UL Listed. UV resistant, suitable for outdoor use. For use in wet or damp locations, UL Marine Listed. Non-metallic, non-corrosive, will not rust or fade. Fits two gang metallic and non metallic boxes. Includes stainless steel mounting screws and gasket. UL Listed. With captive nails and ten integral clamps, three top and bottom, two each side. Suitable for masonry walls. 4" x 4" square. UL Listed. Add-A-Depth ring used to correct for a 3" x 2" switch box or 4" square box (2 needed) set too deep in a wall. Adjustment range 1/4" to 1", two 1-1/8" long screws included. UPC bar code. Holding prong, box clip holds box in place for nailing. Design resists bending and twisting. With stud. Length 14-1/4" thru 22-1/2". With locking tabs to hold bar in position. UL Listed. Four cable pryouts and one 1/2" KO side, one - 1/2" KO bottom. Octagon boxes are used in the installation of ceiling or wall light fixtures. TS bracket features gauging tabs and recessed nailing spurs, for wood or metal studs. Acceptable for use in 2-hour fire rated walls and ceilings. 1-1/2" deep - 15.5 cubic inches. UL Listed. UPC bar code. Ceiling box with nails, speed clamps. 50 lb. fixture rated. 2 hour wall and ceiling fire rating classification. 4" diameter x 2-3/8" depth. UL Listed. Lightweight design and durable plastic. Safe to install and will never rust or corrode. Includes hardware for easy installation. Rigid wall box. 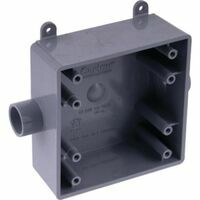 For adding additional cubic capacity or as an outlet box for surface conduit. Eight 1/2" and four 3/4" conduit knockouts (sides). 4" square x 1-1/2" deep. 22.5 cubic inches. UL Listed. Ceiling box with 14.38"-22.5" adjustable bar hanger. 4" diameter x 2-1/4" depth. Fixture spacing for 2-3/4" and 3-1/2". Integral clamps. Listed for fixture support up to 50 pounds. UL Listed. 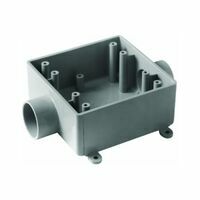 For adding additional cubic capacity or as an outlet box for surface conduit. Twelve 1/2" side knockouts, drawn metal, suitable for use in 2-hour fire rated walls. 4" square x 1-1/2" deep, 22.5 cubic inch capacity. UL Listed. Raco Handy Box, 1 Gangs, 8 Knockouts, 1/2 in Knockout, 6-7/16 in Length, 2-7/32 in Width, 2-1/8 in Depth, Screw-On, Nail On, Bracket Mounting, 16.5 cu-in Capacity, Steel, Metallic, Includes: 1/2 in Knockouts and A Bracket, CSA LR-1082, UL E195978, For Convenience Outlets, Switch Boxes or Small Junction Boxes Raco Handy Box, 1 Gangs, 8 Knockouts, 1/2 in Knockout, 7 in Length, 2-3/8 in Width, 2-1/8 in Depth, Bracket Mounting, 16.5 cu-in Capacity, Steel, Metallic, Includes: 1/2 in Knockouts and TS Bracket, CSA LR-1082, UL E195978, For Convenience Outlets, Switch Boxes or Small Junction Boxes Extension rings provide a means for adding 11.8 additional cubic capacity to a box or as an outlet box for surface conduit. Not designed for ceiling fan support. Four 1/2" conduit knockouts on the sides. 50 pound maximum recommended static load. Acceptable for use in 2-hour rated walls and ceilings. 1-1/2" deep x 11.8 cubic inches. UL Listed. For use with non-metallic sheathed cable. Listed for masonry walls, permissible for use with 90 degree C connectors. Mounted with nails or screws. 3-1/2" diameter x 5/8" depth. For use with non-metallic sheathed cable. Listed for masonry walls, permissible for use with 90 degree C connectors. Mounted with nails or screws. 4" diameter x 1-5/8" depth. Listed for fixture support up to 50 lb. UL Listed. RoHS Compliance. Listed for masonry walls, UL classified for 2 hour fire wall or fire ceiling. UL Listed. 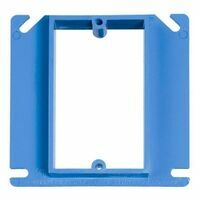 Raco Two Device and Tile Cover, Square, 1/2 in x 4-11/16 in. 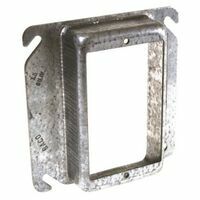 square, 2 Gangs, 5.5 cu-in Capacity, Steel, Gray, Galvanized, UL E195978, CSA LR-1082, 1/2 in Raised, For Mounting Switches or Receptacles Thermoset-fiberglass with ears, snap bracket, speed clamps. Lightweight, non-corrosive, non-conductive, no ground required, will not melt or distort in high heat. Shatter resistant in cold temperatures. 2 hour wall fire rating. 2-7/8" x 2-3/8" x 3-1/4". UL Listed. With non-metallic sheathed cable clamps. Two 1/2" conduit knockouts and four cable knockouts, (sides). One 1/2" conduit knockout, (bottom). Can be used in the installation of ceiling or wall lighting fixtures or as a junction box. Not designed for ceiling fan support. 50 pound maximum recommended static load. J side-mount bracket with spurs and holes for toe-nailing, for wood studs or joists. UPC bar code. UL Listed. Used to close outlet box. For mounting switches or receptacles. Size 4", UL Listed. With non-metallic sheathed cable clamps. Two 1/2" conduit knockouts and four cable knockouts, (sides). One 1/2" conduit knockout, (bottom). Octagon boxes can be used in the installation of ceiling or wall lighting fixtures or as a junction box. Not designed for ceiling fan support. 1-1/2" deep, 11.8 cubic inch capacity. UL Listed, acceptable for use in 2-hour fire rated walls. Four cable knockouts (sides). Two 1/2" and one TKO conduit knockouts (sides). One 1/2" conduit knockout (bottom). With non-metallic sheathed cable clamps. 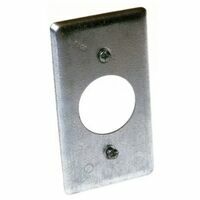 FM flush side-mount bracket for wood or metal studs. Square boxes are installed in ceilings or walls for lighting fixtures or receptacles. Acceptable for use in 2-hour fire rated walls. 4" square x 1-1/2" deep - 21.0 cubic inches. UPC bar code. UL Listed. Four cable knockouts (end). Two 1/2" conduit knockouts, (end). One 1/2" conduit knockout (bottom). "LB" bracket for wood studs, 5/8" offset to clear narrow door molding. Face mounts on front edge of wood stud. Use when space between studs is limited. With clamps for non-metallic sheathed cable. 3" x 2" x 2-1/2" deep. 12.5 cubic inches. UL Listed. Eccentric knockouts, non-metallic and non-conductive. Can be mounted to wood or steel studs. 3.53" height x 2.10" width x 3.25" depth. Lightweight, noncorrosive, and nonconductive, rigid, nonmetallic wiring box combines features of hard shell thermoset box and thermoplastic PVC style box. Molded of specially formulated, strong thermoplastic material, will not crack or break, even in extreme environments. Resists flexing and holds shape even under the worst conditions. Provides large wirefill capacity, and comes with molded-in nailing flanges and molded-in swing clamps to make installation faster. Designed to nest inside one another to take up less shelf space and are easier to transport to job sites. 3.85" x 2.41". UL Listed. Raco Square Box, 14 Knockouts, (3) 1/2 in Conduit Bottom, (2) (1/2 in - 3/4 In) Conduit Threaded Knockout Bottom, (8) 1/2 in Conduit Sides, (4) (1/2 in - 3/4 In) Conduit Threaded Knockout Sides Knockout, (6) 1/2 in (3) TKO, Side Knockout (3) 1/2 in (2) TKO, Bottom Knockout Cable Entry, 1-1/2 in Depth, Square Shape, Screw-On Mounting, Steel With non-metallic sheathed cable clamps. With ear brackets. Two 1/2" conduit knockouts and four cable knockouts, (sides). One 1/2" conduit knockout, (bottom). Can be used in the installation of ceiling or wall lighting fixtures or as a junction box. Not designed for ceiling fan support. 50 pound maximum recommended static load. 1-1/2" deep, 15.5 cubic inch capacity. Acceptable for use in 2-hour fire rated walls. UL Listed. One 1/2" bottom knockout. Four cable knockouts. 2-1/2" deep x 12.5 cubic inches. Armored cable/metal clad/flex clamps. Old work clips on side of box eliminates the need for additional box supports to secure box in wall opening. Acceptable for use in 2-hour rated walls. UL Listed. UPC bar coded. Four 1/2" conduit knockouts (sides). Four cable knockouts (end). Two 1/2" conduit knockouts (end). One 1/2" conduit knockout (bottom). With non-metallic cable clamps in each end. 3" x 2" x 3-1/2" deep. 18.0 cubic inches. Adjustable plaster ears allow box to be used in old work applications. Acceptable for use in 2-hour rated walls. UL Listed. Conduit wiring system. Two 1/2" and twelve TKO conduit knockouts (sides). One 1/2", three TKO conduit knockouts (bottom). No bracket, installed in ceilings or walls for lighting fixtures or receptacles. 4-11/16" square x 2-1/8" deep - 42.0 cubic inches. Combination cover screw heads provide for faster mudring/cover installation. UPC bar code. UL Listed. Four cable knockouts (sides). Four 1/2" and two TKO conduit knockouts (sides). One 1/2" conduit knockout (bottom). With clamps for non-metallic sheathed cable. Square boxes are used where multiple conductor runs are split into two or more directions to bring power to a number of electrical devices. 4" square x 1-1/2" deep - 21.0 cubic inches. UL Listed, acceptable for use in 2-hour fire rated walls. UPC bar code. Four cable knockouts (end). One 1/2" conduit knockout (bottom). Clamp screws through beveled corners. With clamps for non-metallic sheathed cable. Adjustable plaster ears allow box to be used in old work applications. Old work clips on side of box eliminates the need for additional box supports to secure box in wall opening. 3" x 2" x 2-1/4" deep. 10.5 cubic inches. Four cable knockouts (end). Two 1/2" knockouts (end). With NMSC, non-metallic sheathed cable clamps. Old work clip. 3" x 2" x 2-1/2" deep - 12.5 cubic inches. Acceptable for use in 2-hour rated fire walls. UL Listed. Shallow ceiling fan outlet box with mounting screws. 1 integral clamp. Non-conductive high impact lightweight PVC. 5 knock outs, 8 cubic inch capacity. For new work or renovations. Mounts ceiling fan securely to the ceiling joist. Rated for fans up to 35 pounds and fixture up to 50 pounds. 4" diameter x 5/8" depth. UL Listed. Thermoset-fiberglass, with angled mid-nails, speed clamps. Lightweight, non-corrosive, non-conductive, no ground required, will not melt or distort in high heat. Shatter resistant in cold temperatures. 2 hour wall fire rating. 3" depth x 4" x 3-3/4". UL Listed. Extends an existing box by 1-1/8". Used to correct problems from remodeling where the wall surface is extended. Fits between the wiring device and the wall surface. Extends the switch or outlet box to flush with the wall. Works with all standard wiring devices. 2-1/4" x 3-1/4". UL Listed. Non-metallic sheathed cable clamps. Ceiling box with 14 -1/4" - 23-1/2" adjustable bar hanger. Fixture spacing for 2-3/4" and 3-1/2". 4" diameter x 2-1/4" depth. Ground lug and screw. 6 integral clamps. Listed for fixture support up to 50 lb. UL Listed, meets NEMA OS-2. Brown, with N bracket, nails and high clamps. For use with non-metallic sheathed cable. Listed for masonry walls, permissible for use with 90 degree C connectors. 4" diameter x 2-3/8" depth. Listed for fixture support up to 50 lb. UL Listed. RoHS Compliance. 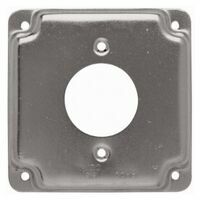 Raco Plaster Ring Cover, Raised, Square, 1/2 in Length, 4-11/16 in Width, 4-11/16 in Depth, 2 Gangs, 3 cu-in Capacity, Steel, Gray, Galvanized, UL E195978, CSA LR-1082, For Mounting Switches or Receptacles Lightweight, noncorrosive, and nonconductive, rigid, nonmetallic wiring box combines features of hard shell thermoset box and thermoplastic PVC style box. 4" diameter x 2.95" depth. Molded of specially formulated, strong thermoplastic material, will not crack or break, even in extreme environments. Resists flexing and holds shape even under the worst conditions. Provides large wirefill capacity, and comes with molded-in nailing flanges and clamps to make installation faster. Listed for fixture support up to 50 lb. Hanger bar adjusts from 11-1/2" to 18-1/2". UL Listed. Installed flush in ceilings or walls for lighting fixtures, switches or receptacles, used where multiple conductor runs are split into two or more directions to bring power to a number of electrical devices. Combination cover screw heads for faster mud ring/cover installation. TS bracket for wood or metal studs, features gauging tabs and recessed nailing spurs. Fixture support of 6 lb. maximum. 30.3 cubic inch capacity 4" square x 2-1/8" depth with 6 eccentric 1/2" and 3 TKO side knockouts and 3 eccentric 1/2" and 2 TKO bottom knockouts. Acceptable for use in 2-hour fire rated walls. UL Listed. Extra large box. 6 clamps to hold cable, swing out clamps to hold to the wall. Engraved with NEC approved conductor fill. 13" x 6.25" x 8". UL Listed. Safe, non-metallic, non-conductive. Molded instructions. 12 integral clamps, 6 each side. Bracket and captive nails included. 2-1/2" depth x 3-7/10" x 7-3/5". Ceiling fan 4" round pan, 1/2" deep, 6 cubic inches, 5 bottom 1/2" knockouts. Used for new work and renovations. Ceiling fan rated, used in the installation of heavy light fixtures or ceiling fans. Maximum 70 pound fan or 150 pound fixture. Includes nonmetallic sheathed cable connector, mounting hardware, and instructions. Acceptable for use in 2-hour rated walls and ceilings. UL Listed. Made from rugged polycarbonate material, yellow color, gasket seals all openings to prevent air or vapor penetration. Front-mounted ground screw, 1/2" setback, flush bracket. Self-clamping, nonmetallic sheathed cable entry tabs. Lightweight, noncorrosive, and nonconductive, rigid, nonmetallic wiring box combines features of hard shell thermoset box and thermoplastic PVC style box. Molded of specially formulated, strong thermoplastic material, will not crack or break, even in extreme environments. Resists flexing and holds shape even under the worst conditions. Provides large wirefill capacity, and comes with molded-in nailing flanges and molded-in swing clamps to make installation faster. Designed to nest inside one another to take up less shelf space and are easier to transport to job sites. 3.85" x 4.17". UL Listed. Molded of engineering grade non-metallic thermoplastic. Adjustable, no need to remove or relocate mounting screws to re-position the box. Slots retain slider plate and guide it in a straight motion. Internal rails guide slider plate for smooth mounting adjustability in wall substrates from 1/2" to 1-3/8" thick and ceiling substrates from 1/2" to 1-5/32". Square corner design allows easy wall cut-in (Old work applications). Molded spline device holes for quick device screw installation. 23 cubic inch volume, 1/2" knockout. Internal steel, stud/wood screws. 3-9/16" depth x 2-1/4" width x 3-3/4" height. UL Listed for 2 hour fire resistive walls and ceilings. Raco Switch Box, 9 Knockouts, (4) 1/2 in, (4) 1/2 in, (1) 1/2 in Knockout, 3-1/2 in Depth, 18 cu-in Capacity, Steel, UL E195978, For Use With Conduit Four 1/2" conduit knockouts (sides). Four cable knockouts (end). Two 1/2" conduit knockouts (end). One 1/2" conduit knockout (bottom). 3" x 2" x 3-1/2" deep. 18.0 cubic inches. With clamps for non-metallic sheathed cable. "TS" brackets for wood or metal studs. Gauging tabs and recessed nailing spur. Side mount. UL Listed. Thomas & Betts Mounting Bracket, Adjustable, Low Voltage, Non-Metallic, 3-3/4 in Length, 3-7/8 in Width, Nail On, Screw-On Mounting, Orange, CSA Certified, UL Listed, 1 Gang, For New Work or Retrofit (Old Work) Applications Raco Square Box, 2 Outlets, 13 Knockouts, 4 in Diameter, 4 in Length, 4 in Width, 2-1/8 in Depth, Square Shape, Flush Mounting, 30.3 cu-in Capacity, Steel, Gray, UL E195978, For Use With Conduit Patented design provides simple, goof-proof installation and allows the installer to adjust the box to any thickness with the turn of a screw. Clip the included bracket onto any stud, mounts square and secure every time. Securing the bracket to the stud ensures that the box will not move. Comes preset at 1/2". 3" depth x 5-5/8" x 3-5/8". Satisfies NEC 370-20. UL Listed 5Z74 and classified 2 Hr W/C. 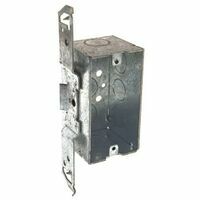 Raco Electrical Box, 2 Gangs, 13 Knockouts, 1/2, 3/4, 1 in Knockout, 4-11/16 in Length, 2-1/8 in Depth, Square Shape, Surface Mounting, 42 cu-in Capacity, Steel, Galvanized, Includes: Ground Screw, UL E195978, For Conduit, NMSC, Armored, Metal Clad and Flex Cable and Industrial Applications Raco Plaster Ring Cover, Raised, Square, 1 in Length, 4 in Width, 4 in Depth, 1 Gangs, 6.8 cu-in Capacity, Steel, Gray, Galvanized, UL E195978, CSA LR-1082, For Mounting Switches or Receptacles Bracket clips on any stud. Securing the bracket to the stud ensures that the box will not move. The box snaps into place on the bracket, square and secure every time. Then turning the screw clockwise or counterclockwise adjusts the box in or out to make it flush with any wall covering. Easily removable to allow inner wall access, or to switch between single gang and double gang boxes. Accommodates high and low voltage applications. Pre-installed ground lug. Flat bottom cable priouts. UL Listed. Rigid wall box. Lightweight design and durable plastic. Safe to install and will never rust or corrode. Allows for large wiring devices (GFIs and dimmers). Includes hardware for easy installation. Safe, non-conductive. For dead-end terminations. With integral mounting feet. Will not rust or corrode. 18 cubic inch capacity. UL Listed. Safe, non-conductive. For dead-end terminations. With integral mounting feet. Will not rust or corrode. 18 cubic inch capacity. UL Listed. Safe, non-conductive, takes standard covers and accessories. For through terminations. With detachable mounting feet. 19 cubic inch capacity. Mounts with screws, 14 cubic inch capacity. For use with non-metallic sheathed cable. 4-1/2" length x 2-3/4" width x 1-5/8" depth. UL Listed. Mounts with screws, 14 cubic inch capacity. For use with non-metallic sheathed cable. 4-1/2" length x 2-3/4" width x 1-5/8" depth. UL Listed. Combination two gang/four square box. Eccentric knockouts, non-metallic and non-conductive. Thermoset-fiberglass, with ears, wing brackets and speed clamps. Lightweight, non-corrosive, non-conductive, no ground required, will not melt or distort in high heat. Shatter resistant in cold temperatures. 2-3/4" depth x 4-1/8" x 3-1/4". 2 hour wall fire rating. UL Listed. Thermoset-fiberglass with angled mid-nails, speed clamps. Lightweight, non-corrosive, non-conductive, no ground required, will not melt or distort in high heat. Shatter resistant in cold temperatures. 2 hour wall fire rating. 3" depth x 5-11/16" x 3-3/4". UL Listed. Safe, non-conductive, takes standard covers and accessories. For through terminations. With detachable mounting feet. 19 cubic inch capacity. Non-conductive high impact lightweight PVC. Full 20 cubic inch capacity. 6 integral clamps. 4" diameter x 2-1/4" depth. Used for new work or renovations. Rated for fans up to 35 pounds and fixture up to 50 pounds. Mounts fan to a cross member secured between ceiling joist. Mounting screws included. UL Listed. For new construction or applications where attic is accessible. Fits all ceiling fans. Maximum load rating for ceiling fans is 70 pounds. 100 pounds for fixtures. 8-32 threads for lightweight fixtures, 10-24 threads for ceiling fans. 3 knockouts for conduit or Romex. 2 Romex clamps. 1-1/2" deep, 15.5 cubic inch capacity. Includes SAF-T-CAP and mounting screws. UL Listed. For multiple dead-end circuit terminations or where additional support is required in stub-up applications. Takes standard covers and accessories or devices. 18 cubic inch capacity. Ceiling box with hanger bar, adjusts from 11-1/2" to 18-1/2". Lightweight, noncorrosive, and nonconductive, rigid, nonmetallic wiring box combines features of hard shell thermoset box and thermoplastic PVC style box. Molded of specially formulated, strong thermoplastic material, will not crack or break, even in extreme environments. Resists flexing and holds shape even under the worst conditions. Listed for fixture support up to 50 lb. 4" diameter x 3" depth. UL Listed. Ground lug included. Four cable knockouts (end). One 1/2" conduit knockout (bottom). With clamps for non-metallic sheathed cable. 3" x 2" x 2-1/2" deep. 12.5 cubic inches. Adjustable plaster ears allow box to be used in old work applications. Acceptable for use in 2-hour rated fire walls. UL Listed. With non-metallic sheathed cable clamps. Two 1/2" conduit knockouts and four cable knockouts (sides). Used to hang light fixtures between joists or structural members. Includes 4" octagon box. Not designed for ceiling fan support. 10 pound maximum recommended support load. Furnished with 3/8"-18 NPS trade size fixture stud. Bar hanger is adjustable from 14-1/4" to 22-1/2". Box is adjustable along entire length of bar. Acceptable for use in 2-hour fire rated walls. UL Listed. UPC bar code. 1-1/2" deep - 15.5 cubic inches. 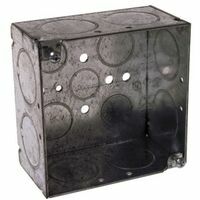 Four inch square, drawn metal box, suitable for use in 2-hour fire rated walls. Conduit wiring system. Twelve 1/2" conduit knockouts (sides). Five 1/2" conduit knockouts (bottom). 2-1/8" deep - 30.3 cubic inches. UL Listed. For multiple dead-end circuit terminations or where additional support is required in stub-up applications. Takes standard covers and accessories or devices. 18 cubic inch capacity. Drawn construction for surface mount applications. Six 3/4" side knockouts, three 1/2" and two 3/4" bottom knockouts. TS bracket for wood or metal studs. 1/2" bracket setback eliminating the need for a plaster ring. 4" square. Acceptable for use in 2-hour rated walls and ceilings. 2-1/8" deep - 30.3 cubic inches. UL Listed. Workbox can accommodate three and four large wiring devices. Installs easily for existing construction remodeling work. 8 clamps securely hold cable. Swing out clamps lock box securely to wall. Lightweight and durable and engraved with NEC approved conductor fill. Suitable for masonry walls. 68 cubic inch capacity, 3.41" depth x 7.57" x 2.89". For dead-end terminations where two devices or additional wiring capacity is required. Integral mounting feet. 32 cubic inch capacity. Type 2FSE UL Listed. Four cable knockouts (sides). Two 1/2" and one eccentric TKO conduit knockout (sides). One 1/2" conduit knockout (bottom). 2-1/8" deep. 30.3 cubic inches. With clamps for non-metallic sheathed cable. TS, flush side-mount bracket for wood or metal studs. Fixture support of 6 pounds maximum. Acceptable for use in 2-hour rated fire walls. UL Listed. With non-metallic sheathed cable clamps. Two 1/2" conduit knockouts and four cable knockouts (sides). Used to hang light fixtures between joists or structural members. Includes 4" octagon box. Not designed for ceiling fan support. 10 lb. maximum recommended support load. Furnished with 3/8"-18 NPS fixture stud. Bar hanger is adjustable from 14-1/4" to 22-1/2". Box is adjustable along entire length of bar. Acceptable for use in 2-hour fire rated walls. UL Listed. UPC bar code. Used to mount switches or receptacles on boxes in surface mount applications. Raised 1/2". For one 30-50 amp, single receptacle 2.141" diameter. 10.3 cubic inch capacity. UL Listed. Drawn construction for surface mount applications. Conduit wiring system. Eight 1/2" and four 3/4" conduit knockouts (sides). Three 1/2" and two 3/4" conduit knockouts (bottom). 4" square. 2-1/8" deep - 30.3 cubic inches. Acceptable for use in 2-hour rated fire walls. UL Listed. Safe, non-conductive, takes standard covers and accessories. For through terminations. With detachable mounting feet. 19 cubic inch capacity. For dead-end terminations where two devices or additional wiring capacity is required. Safe, non-conductive, will not rust or corrode. Integral mounting feet provide easy mounting. Type 2FSE. 32 cubic inch capacity. UL Listed. 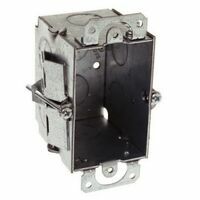 Thomas & Betts Mounting Bracket, Adjustable, Low Voltage, Non-Metallic, 3-5/8 in Length, 5-5/8 in Width, Orange, CSA Certified, UL Listed, 2 Gang, For New Work or Retrofit (Old Work) Applications Thomas & Betts Electrical Switch Box, Non-Metallic, Rigid, Series: FSCC, 3 Gangs, 3/4 in Hub, (3) 3/4 in Hub Cable Entry, Rectangular Shape, Integral Mounting, 18 cu-in Capacity, PVC, Includes: Integral Mounting Feet, CSA Certified, UL E42728, For Multiple Through Circuit Terminations or Where Additional Support Is Required In Stub-up Applications New work ceiling fan box with nails and metal brace for stud finishing. Rated for fans up to 35 pounds and fixtures up to 50 pounds. 4.062" diameter x 3.06" depth. Lightweight, noncorrosive, and nonconductive, rigid, nonmetallic wiring box combines features of hard shell thermoset box and thermoplastic PVC style box. Molded of strong thermoplastic material, will not crack or break, even in extreme environments. Resists flexing and holds shape even under the worst conditions. 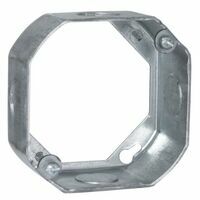 Provides large wire capacity, and comes with molded-in nailing flanges. UL Listed. Non-metallic, non-conductive. For use with non-metallic sheathed cable. Listed for masonry walls, permissible for use with 90 degree C connectors. 30" capacity, 4-1/4" length x 4-1/4" width x 2-3/8" depth. UL Classified for 2 hour fire wall or fire ceiling. Weatherproof, for use with nonmetalic wiring systems. Nonconductive, noncorrosive, and impact resistant for a safe, long, service-free life in exposed applications. Install in accordance with NEC and local codes. Three 1/2" threaded ports, one on each end and one in the back. UL Listed. Made from rugged polycarbonate material, yellow color, gasket seals all openings to prevent air or vapor penetration. Front-mounted ground screw, 1/2" setback, 4" round flush bracket. Self-clamping, nonmetallic sheathed cable entry tabs. Used independently of vapor barrier hats. 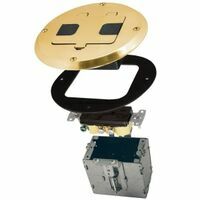 Used to mount switch or receptacle on box in surface mount applications. Raised 1/2". For one 30-60 amp, single receptacle 2.625" diameter. 10.3 cubic inches. UL Listed. Round polycarbonate, 4" diameter, 12.5 cubic inch black non-metallic ceiling fan support saddle box, used in new work to mount a ceiling fan or heavy light fixture. Supports a 70 pound fan, or 210 pound fixture. Saddle design straddles standard joist. Hands free installation. 1/2" setback. Two 1/2" knock outs on the side. 4 cable clamps, mounting hardware, instructions, and high strength, hardened screws included. 2-hour fire rating, UL Orange Book. UL Listed. Made from rugged polycarbonate material, yellow color, gasket seals all openings to prevent air or vapor penetration. Front-mounted ground screw, 1/2" setback, flush bracket. Self-clamping, nonmetallic sheathed cable entry tabs. For use with non-metallic sheathed cable. With screws. 6-1/4" outside diameter x 3-1/8" inside diameter x 3/4" depth. 3.8" cubic inch capacity. Not UL Listed. Manufactured from PVC thermoplastic molding compound and featuring gasketed lids attached with stainless steel screws. Offers corrosion resistance and physical properties needed for direct burial applications. Intended for indoor or outdoor use, to provide a degree of protection against contact with enclosed equipment, falling dirt, hose directed water, entry of water during prolonged submersion at a limited depth, and external ice formation. UL Listed with a NEMA 6P rating per section 314.29. Four knock-out type socket openings, 90 degree spacing. Includes separate mounting feet, cover and gasket. Non-conductive. Will not rust or corrode. Bracket clips on any stud. Securing the bracket to the stud ensures that the box will not move. The box snaps into place on the bracket, square and secure every time. Then turning the screw clockwise or counterclockwise adjusts the box in or out to make it flush with any wall covering. Easily removable to allow inner wall access, or to switch between single gang and double gang boxes. Accommodates high and low voltage applications. Pre-installed ground lug. Flat bottom cable priouts. UL Listed. Ceiling fan box, 4" octagon, 1-1/2" deep. 3 bottom 1/2" knockouts. Used in new work and renovations. Ceiling fan rated octagon boxes can be used in the installation of heavy light fixtures or ceiling fans. Recommended support load for ceiling fan is 70 pounds, for fixtures is 150 pounds. Includes non-metallic sheathed cable connector, mounting hardware, high strength hardened screws, and instructions. Acceptable for use in 2-hour rated walls and ceilings. UL Listed. Four knock-out type socket openings, 90 degree spacing. Includes separate mounting feet, cover and gasket. Non-conductive. Will not rust or corrode. Four inch round ceiling box with universal bar hanger, adjustable bar assembly from 16" to 24". 4" diameter x 2-7/16" depth. Speed clamps, 50 lb. fixture rated. 2 hour wall and ceiling fire rated, UL Listed. Conduit wiring system. Gangable switch box offers the option of constructing a box to hold two or more devices. Adjustable plaster ears allow box to be used in old work applications. Provided old work clips on side of box eliminates the need for additional box supports to secure box in wall opening. Two 1/2" bottom knockouts and two 1/2" end knockouts. 2-1/2" deep - 12.5 cubic inches. UL Listed. Molded of engineering grade non-metallic thermoplastic. Adjustable, no need to remove or relocate mounting screws to re-position the box. Slots retain slider plate and guide it in a straight motion. Internal rails guide slider plate for smooth mounting adjustability in wall substrates from 1/2" to 1-3/8" thick and ceiling substrates from 1/2" to 1-5/32". Square corner design allows easy wall cut-in (Old work applications). Molded spline device holes for quick device screw installation. 42 cubic inch volume, two 1/2" knockouts. Internal steel, stud/wood screws. 3-9/16" depth x 4" width x 3-3/4" height. UL listed for 2 hour fire resistive walls. For use with non-metallic sheathed cable. With screws. 6-1/4" outside diameter x 3-1/8" inside diameter x 3/4" depth. 3.8" cubic inch capacity. Not UL Listed. Ceiling fan box, 4" octagon, 1 bottom 1/2" TKO knockout. 2-1/8" depth, 22.3 cubic inches. Used in new work and renovations. 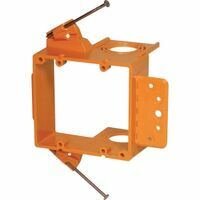 Features FA bracket for wood studs or joists, which allows box to be securely mounted flush. Ceiling fan rated, can be used in the installation of heavy light fixtures or ceiling fans. Recommended support load for ceiling fan is 70 pounds, for fixtures is 150 pounds. Includes non-metallic sheathed cable connector, mounting hardware, high strength hardened screws, and instructions. Acceptable for use in 2-hour rated walls and ceilings. UL Listed. Molded of engineering grade non-metallic thermoplastic. Adjustable, no need to remove or relocate mounting screws to re-position the box. Slots retain slider plate and guide it in a straight motion. Internal rails guide slider plate for smooth mounting adjustability. 4" diameter x 2-3/4" width, 25 cubic inch volume, two 1/2" knockouts. Internal steel, stud/wood screws. Fixture rating 50 pounds. UL Listed for 2 hour fire resistive walls and ceilings. For use with non-metallic sheathed cable. With screws. 6-1/4" outside diameter x 3-1/8" inside diameter x 3/4" depth. 3.8" cubic inch capacity. Not UL Listed. Nonmetallic threaded switch box with five 1/2" threaded holes, for exposed applications with nonmetallic wiring systems only. Mounting feet included. 4" diameter. 13.5 cubic inch capacity. Ceiling fan box with brace, 1-1/2" deep, 15.8 cubic inch box, for new work, to hang ceiling fans and light fixtures between joists or structural members safely and securely. Drawn construction. Maximum 70 pound fan or 90 pound fixture. Brace is adjustable form 16" to 24". Includes 2 end 1/2" knock outs. Acceptable for use in 2-hour fire rated walls and ceilings. UL Listed. With screws, 23.8 cubic inch capacity. For use with non-metallic sheathed cable. 4-9/16" length x 4-1/2" width x 1-5/8" depth. With screws, 23.8 cubic inch capacity. For use with non-metallic sheathed cable. 4-9/16" length x 4-1/2" width x 1-5/8" depth. With screws, 23.8 cubic inch capacity. For use with non-metallic sheathed cable. 4-9/16" length x 4-1/2" width x 1-5/8" depth. For use with nonmetalic wiring systems. Nonconductive, noncorrosive, and impact resistant for a safe, long, service-free life in exposed applications. Install in accordance with NEC and local codes. Three 1/2" plus four 3/4" threaded ports. UL Listed. Welded construction. Conduit wiring system. Two 1/2" and two 3/4" knockouts (sides). Three 1/2" and three 3/4" knockouts (bottom). Six 1/2" and six 3/4" knockouts (end). FM type bracket for wood or metal studs. 2-1/2" deep - 47.8 cubic inches. UL Listed. Manufactured from PVC thermoplastic molding compound and featuring gasketed lids attached with stainless steel screws. Offers corrosion resistance and physical properties needed for direct burial applications. Intended for indoor or outdoor use, to provide a degree of protection against contact with enclosed equipment, falling dirt, hose directed water, entry of water during prolonged submersion at a limited depth, and external ice formation. UL Listed with a NEMA 6P rating per section 314.29. Used to close outlet box. For mounting switch or receptacle. Size 4" x 4",steel, UL Listed. Manufactured from PVC thermoplastic molding compound and featuring gasketed lids attached with stainless steel screws. Offers corrosion resistance and physical properties needed for direct burial applications. Intended for indoor or outdoor use, to provide a degree of protection against contact with enclosed equipment, falling dirt, hose directed water, entry of water during prolonged submersion at a limited depth, and external ice formation. UL Listed with a NEMA 6P rating per section 314.29. Ceiling fan box with brace, 1-1/2" deep, 15.8 cubic inch capacity. Used to hang ceiling fans and light fixtures between joists or structural members safely and securely in old work applications where access is limited. Brace allows simple expansion, adjustable form 16" to 24". Recommended support load for ceiling fan is 35 pounds, for fixtures is 50 pounds. 4 half inch side, three bottom knock outs. Mounting hardware with high strength, hardened screws and instructions included. Acceptable for use in 2-hour rated walls and ceilings. UL Listed. Nonmetallic ABS material is lightweight, paintable and easy to handle. Recessed low profile design provides ample room behind dry wall and between studs to accommodates cable bend requirements. Hides the wires, cables, cords and plug heads used with flat panel display installations. Has a two gang low voltage opening and a universal one gang opening for an outlet or switch box (boxes, devices, and plates not included). 4 swing out clamps lock the plate securely to the wall, horizontal or vertical mount. 2.72" depth x 5.25" width x 10.5" length. Conduit wiring system. Welded construction. FM bracket for wood or metal studs. Eight conduit knockouts (sides). Two conduit knockouts (end). Four conduit knockouts (bottom). 63.5 cubic inch capacity. 7-19/32" wide x 2-1/2" deep. UL Listed. Made of 16 gauge steel. Junction boxes for terminating power or communication conductors. Boxes have flat, removal covers fastened with screws. Mounting holes in the back. Gray enamel finish. For remodel or new construction. Applications fits 16" to 24" ceiling joists, fits all ceiling fans, and installs without going into the attic. Includes a heavy duty 15.5 cubic inch 1-1/2" deep dual mount box and mounting hardware. Maximum load rating for ceiling fans: 70 pounds, fixtures 100 pounds. Support fan brace has locking screws and teeth. Each end screws into joist independently, with 4 teeth and single screw on each end. 8-32 threads for lightweight fixtures, 10-24 threads for ceiling fans. Six 1/2" Romex or conduit knockouts. UL Listed. Made of 16 gauge steel. 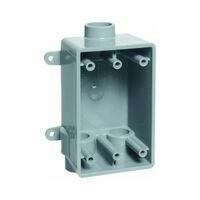 Junction boxes for terminating power or communication conductors. Boxes have flat, removal covers fastened with screws. Mounting holes in the back. Gray enamel finish. Non-metallic PVC floor box. Water tight gasket and corrosion resistant hardware. Concrete or wood subfloor construction approved. Minimum concrete dept required is 3-1/2". Will provide optional low voltage divider permitting three services (data, telephone, and power) access. Accepts 1/2", 3/4" and 1" conduit and has PVC molded ports. Includes two 1" x 3/4", two 3/4" x 1/2" reducer plugs and two 1" and 3/4" hubs. 90 cubic inch capacity. Used to close outlet box, blank, no holes on face. 4" square, 6.5 cubic inch capacity. UL 514-A Listed, CSA Listed. Leviton Single Floor Receptacle, Tamper Resistant, 2 Poles, 3 Wires, 14 - 10 AWG Wire, 15 A, 125 V, Nema 5-15R, Screw-On Mounting, Self-Grounding Grounding, 2000 V Dielectric Strength, 4-1/2 in Overall Length, 2-3/4 in Overall Width, Nylon, Ivory, -40 TO 75 deg C, Includes: Brass Wallplate and Screw Cap, Back and Side Wired, Steel Strap Duplex outlet with ABS cover and dual hinge caps to keep out dust. Adjusts from 0" to 1-7/8", 21 cubic inch capacity. UL Listed 5274 and classified 2HR W/C. UL514C scrub water tested. Patented residential design. Single hole installation. Includes everything needed to install including a hole saw, solid brass cover and single gang grounded receptacle. 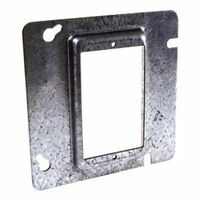 Low voltage telephone/cable insert plate included. Includes blank plate for custom installation. Polycarbonate construction. Manufactured from PVC thermoplastic molding compound and featuring gasketed lids attached with stainless steel screws. Offers corrosion resistance and physical properties needed for direct burial applications. Intended for indoor or outdoor use, to provide a degree of protection against contact with enclosed equipment, falling dirt, hose directed water, entry of water during prolonged submersion at a limited depth, and external ice formation. UL Listed with a NEMA 6P rating per section 314.29. Includes box, gasket, receptacle, brass cover plate and closure cap with rubber "O" ring. Can be used in industrial and residential environments. UL Listed. Raco Floor Box Kit, 1 Gangs, 3 Knockouts, 1/2 in Knockout, 5.3 in Length, 5.6 in Width, 5.6 in Depth, Round Shape, Floor Mounting, 28 cu-in Capacity, Steel, Brass, UL Listed, CSA Certified, For Wooden Floors Flush floor mount, for duplex or GFCI receptacle, used with Carlon floor box E971FB. Solid brass cover, plastic adapter ring, gasket and everything needed for installation is included. (Receptacle sold separately). Round duplex receptacle floor box. 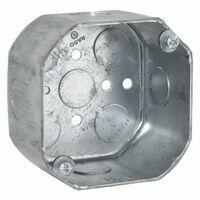 Duplex cover with lift lids, 2-1/2" bottom knockout, 18.5 cubic inch capacity. Cast iron construction with gray powder coat finish for corrosion resistance. Suitable for carpet, tile or wood floor applications. Mop water tight. If floor covering is used, discard included brass tile flange and replace with RACO 6235 carpet flange. Includes: box, brass duplex lift lid cover, and brass tile flange. Receptacle not included. UL Listed. 4.19" diameter. Welded construction. Rectangular shape fits square cuts in block. Device ears inside the box, preventing mortar from getting in the device hole. Use a standard wall plate cover. Concentric knockouts, 6 end, 3 bottom and 4 sides. Nongangable. 47.8 cubic inches. 5-19/32" wide x 2-1/2" deep. Used in 4" block walls. UL Listed. Old work wall case. Safe, non-conductive. Two Zip-Mount retainers. Four integral clamps, two each end; mounting ears. 14 cubic inch, 2-3/4" x 2-1/4" x 4-1/8". UL Listed. Made of fiberglass, covers a 4" H9343-NK junction box. UL Listed. Brown, with ears, number 4 swing brackets, bulk packed. For use with non-metallic sheathed cable. UL classified for 2 hour fire wall or fire ceiling. UL Listed.